I left UB with my new tyre and a new me after a 4 day rest! Not far out of UB the paved road disappears and opens up into big dirt tracks. Everyone in Mongolia seems to have their own idea of which way is the best to go and in some places this results in 6 or maybe even 10 different roads all going in the same direction but on slightly different paths. Makes it pretty exciting to get to pick which road to take and always wondering if the one over to your right or left may be a bit better. Pretty crazy. Mongolia is like a big enduro course I've decided, it has everything from whoops to rock gardens to water crossings. The first day I didn't leave until UB until 2pm so didn't get all that far, I ended up riding on some really deep sand towards the end of the day, which I hate and with the sun setting in front me ended up camping next to the road. The next day I put in 12 hours and completing 12 (yep, 12) water crossings. Fair enough some of them where just streams, but the last couple where engine stalling 20-30 meter wide fast flowing Mongolian rivers! After the 11th I stopped in at a fella's ger (Mongol tent, for the non-National Geographic readers) and asked about the best way down to the main road. I had attempted to make a shortcut across country and was starting to think I'd never make it back to the main road after 11 water crossings and numerous mountain passes. He gave me some fermented horse milk or whatever is they drink around here and pointed out the way, problem was the raging river I'd just crossed was in the way and raging harder than ever the way he suggested I should go. I mentioned my concern about this using my usual sign language (I still don't know a word of Mongolian) and he indicated in return not to worry about it, just stand up on the pegs and pin it. I think thats what he ment anyway. I left him, his Mrs and his Chinese motorbike to it and went to have a closer look the river. I decided there was no way I was going to try that one, way to deep and heaps too fast. I crossed a bit further up stream which, now that I think about it was pretty nuts anyway. The bike stalled just as I hit the bank of the other side, not drowned (like water in the intake drowned) but enough water around the plugs to stop her I'm guessing. I thought I was pretty well shagged at that stage, the river bank was a good 2 or 3 meters high ( it looked like 10) and steep as. With the back wheel still in the water I thought about dropping the bike and trying to drag it up by the front wheel but decided that the whole bike would end up in the water and proberly be halfway to Russia by the time I turned around to grab it by the look of how fast the water was flowing. With me stuck sitting there holding the bike with the front brake I relised I had forgotton one very important thing, this bike was a DR650 and therefore seemingly indestructable, we'd seen some action together on this trip already, so I should just try and start it. After a couple of trys she started without a problem and I was away. 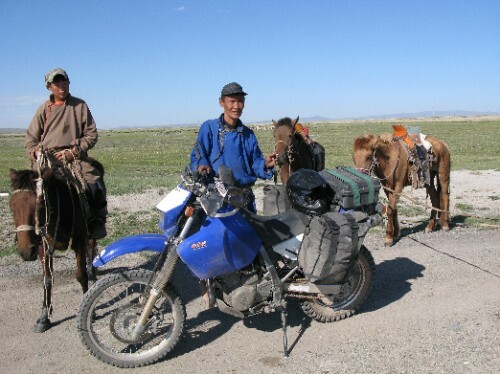 I made the south road about 9pm, found a hotel for $A10 a night and met a kiwi bloke and his Mrs who lived in Mongolia. I had a beer with him and he gave me some really good info that helped me avoid a REALLY impassable river the next day.